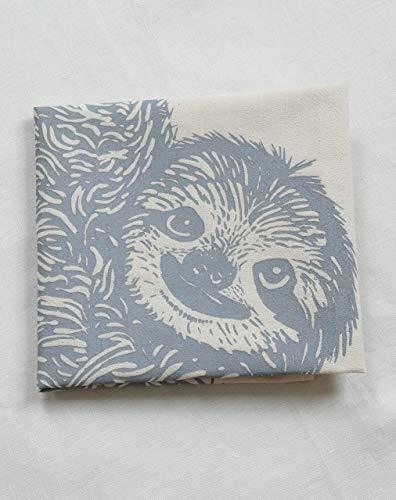 One large organic cotton flour sack tea towel (17" X 38", pre-shrunk), screen printed with my original Sloth design in grey. These are hand printed by me in small batches using environmentally friendly water-based ink. Each print is extra large; a real conversation piece! Premium and high quality, these flour sack towels are both utilitarian in the kitchen and beautiful as a fine dining linen. They are absorbent, lint free, quick drying, and become softer and softer after each wash. They are a classic and will surely be a happy accompaniment in your kitchen and dining adventures. Perfect for draping over your oven handle, lining your bread basket, or folded neatly at the dinner table. The handmade quality of these towels assures that each one is individually unique. I mix the inks in-house and hand pull each print, so slight variations are possible and are a sign of hand-craftsmanship. If you have any questions about this product by Hearth and Harrow, contact us by completing and submitting the form below. If you are looking for a specif part number, please include it with your message.